2) We now show you the ID of your support requests on the "All my requests page". 3) Automated messages from the help desk now include a count of the number of support requests with the same status so you can have a sense of where you are in line. We have also been working to improve our support processes so that we escalate the critical issues as quickly as possible. There has been some confusion about "escalated" support requests. The word escalated suggests that it is critical and needs fixed now, but we were using it to mean "needs developer review". We've now added a "needs review" status and from now on "escalated" means "HOLY COW THE BARN IS ON FIRE PLEASE GET THE WATER". As of this morning, if your ticket gets escalated it is in our highest priority queue. Tickets that were escalated before this morning have been updated to have a status of "Needs Review". We are always working to make our customer support processes better. We think this is a step in the right direction. 1) Some BSA Packs were having trouble with TurboNET imports. We were crashing if there were users who had a first name that was not capitalized in ScoutNET. This problem is fixed. 2) For members with no achievements, when you clicked the "Start Achievement" button on the user profile you would receive a message that the user had already started all achievements. It's now fixed. I'm really glad these two bugs are fixed. They were frustrating a lot of people and they were mystifying us for a while. 1) Photo uploads from the mobile app (https://itunes.apple.com/…/a…/trooptrack-mobile/id1002622052) now work. You don't need to update the app version to get this fix. 2) Overlapping table headers on PDFs have been fixed. Here's what that means: ugly unreadable text on the top of PDFs is gone. 3) The BSA permission slip has been updated to use the 2014 version. Also, I'd like to add a quick note about our enhancement process. Sometimes when we release an update we will get a comment along the lines of "It's nice that you did this, but you really should be working on X instead". These comments sometimes imply that we just work on the stuff we want to work on and ignore requests from users or that we only work on "new" features instead of "fixing" existing ones. That's not how we roll, not at all. Pretty much everything we work on is driven by user requests. We do our best to work on the things that are requested the most, impact the most users, or seem the most important for operating a unit. We aren't perfect at it. Sometimes we aren't even good at it. But that's how we operate, and we sincerely hope that our efforts to make TroopTrack better every single day are paying off for you. Happy Monday! We've got a couple of exciting changes that went live this morning - here's a quick rundown. 1) Dashboards 1.0! Whether you are a leader, scout, or parent, the new dashboard gives you a nice overview of the things you care about. The dashboard is configured based on the privileges you already have. We're certain you will very quickly think of other things you'd like to see on the dashboard, so please let us know by opening a support request. This change is present on the calendar and agenda view of events. 3) Events that don't require an RSVP. There is a new checkbox under the invitee box called "RSVP Required". It is checked by default. If you uncheck it, invitations to the event will now say "RSVP not required" and invitees will not get a notification asking them to RSVP. 4) The colors of the header for Venturing Crew have been updated to be more Crew-ish. 5) A bug preventing Sea Scout Ships from doing anything other than sign up for an account has been fixed. 6) The pop-up you see when you click on an event in the calendar now includes a link to all event payments. 7) The "Invite Members" page now includes a link to reset passwords. We hope these changes please you and make it easier for you to operate your unit effectively! We have been getting a lot of requests lately for the ability to include a note when you RSVP for an event. Well... you asked and we delivered. It went live this morning. Also going live this morning, our BETA of Sea Scouts and Civil Air Patrol. If you are involved with either of these groups, please give it a spin. We have also included a few minor security tweaks and some performance enhancements that improve the speed of power search and anything related to achievements. 1) Dashboard. I've already started work on this, but it's not quite ready to go. There's a chance it will be ready next week, but we will see. 2) "My Events" filter on the calendar. We currently show all events, all the time. This feature would add a filter to show only your events. This would become the default, with the option to view all events. 3) Streamlined event creation. Basically a spreadsheet that lets you plan your recurring events in a snap. 4) Newsletter improvements. The newsletter is plain looking and can be hard to read. Let's make it look nice and more relevant by only showing events the recipient is invited to. 5) Events without RSVPs. This is a common request, to be able to have events where you aren't expected to RSVP. On Thursday, September 17, 2015 we will have a planned outage from 6:00 AM CT to 8:00 CT. We will be performing various security updates and upgrading the database significantly. 1) If you invited a user, patrol, or mailing list to an event, and then deleted that user, patrol, or mailing list, you would receive an error message trying to edit the event later. This is fixed. 2) The access level names listed on the new invite users page were not consistent with the names listed on the privileges tab, causing confusion. Fixed! 3) The "Start Achievement" button on user profiles was very slow. We've optimized the page to make it much faster. 4) Various improvements to our help desk application to make us more efficient. It's been a big week, with lots of new stuff and critical improvements. But it's only Thursday and heck, we aren't done yet! 1) You can now choose attendees to events using mailing lists. I've also tried to make the event invite section stand out a bit more. 2) Attendance sheets now include totals. For each of these dashboards, what would you want to see? How would it look? I once asked users for some feedback on the layout of TroopTrack, and a super kind user actually sent me HTML and CSS for a redesign. We totally used it. So if you have the skills to mock up one of these dashboards, send it to sam@trooptrack.com and we will use it to inspire us. This morning we released a new feature and a number of bug fixes. 2) Sign up sheets were re-designed to make them easier to use and to let everyone see who has signed up for what. They are also now editable by anyone with the proper privileges, regardless of who created them. 3) Better sorting on the record attendance page. Records are now sorted by RSVP status then last name. They were previously only sorted by RSVP status. 4) Multi-troop users who use TroopTrack subdomains were having problems switching troops. This problem is fixed. 5) Minor improvement to the way our navigation bars are displayed. They recently doubled in height for some users and we forced them back. 6) We only show active users now on the invite users view. 7) Sending event emails from a mobile device using the site (not the app) was broken. This is now fixed. 9) We've been making a lot of improvements to our customer support processes. As a result our response time has improved tremendously in the last week - for simple questions during business hours we are now often able to respond in minutes. It's been a long time coming, but it's finally here. TroopTrack Mobile is live and available in the Apple App Story for iPhones and iPads. Now you can take TroopTrack anywhere your adventures take you, even offline. TroopTrack mobile stores a copy of your vital troop information on your device, so even if you don't have a cell or wifi connection you can still look up your calendar or a youth's progress toward an award. TroopTrack Mobile works for ALL supported programs: Boy Scouts, Cub Scouts, AHG, Girl Scouts, Trail Life USA, Civil Air Patrol (in a secret beta! ), LDS Scouting, Scouts Australia, and Baden Powell Service Association. TroopTrack Mobile was created by Marc Alexander, a TroopTrack customer who is also a top-notch mobile developer. He has worked long hours on TroopTrack Mobile on a gamble that our community of users will find it valuable. Thank you Marc for making it happen! All proceeds from the sale of TroopTrack mobile will go to Marc until he has recouped his substantial investment in creating this extremely valuable tool. You can buy TroopTrack Mobile for $4.99 in the App Store. It is set up with Family Sharing, so you can buy it once and use it for everyone in your family. It is a one time charge - you won't need to renew it every year. A valid TroopTrack account (trial, paid, or scholarship) is required to use TroopTrack Mobile. Cream colored award cards! In addition to the white award cards, you can now purchase cream micro-perforated cards as well in packs of 200. Interested in seeing us carry another color? Post to our Facebook page and we'll see how many likes you get. Get enough likes and we will add the color. Privileges are finally human readable when you edit them, making it easier to understand what a person will be able to do when you make changes. Simple sign in sheets are now sorted alphabetically. We made various improvements to our help desk solution that will help us handle your requests more effectively. Finally, with the release of TroopTrack Mobile we are now officially preparing for the general availability of our developer program. We plan to announce the availability of the TroopTrack API for developers to use to create their own tools, either for personal, unit, or general use, in the next two to three weeks. We just need to put the finishing touches on the documentation of the API and deal with bugs discovered in the launch of TroopTrack mobile. 1) Massive upgrade to photo uploads. Have you ever waited a long time to upload a lot of photos and then had to wait a long time while TroopTrack processed them? No more! Thanks to Ryan's hard work, photo processing is now "infinitely scalable" which just means TroopTrack will process all your photos at once instead of one at a time. Now the only limit on storing photos in TroopTrack is your upload bandwidth. Seriously. Upload all the photos you want. We can take it. 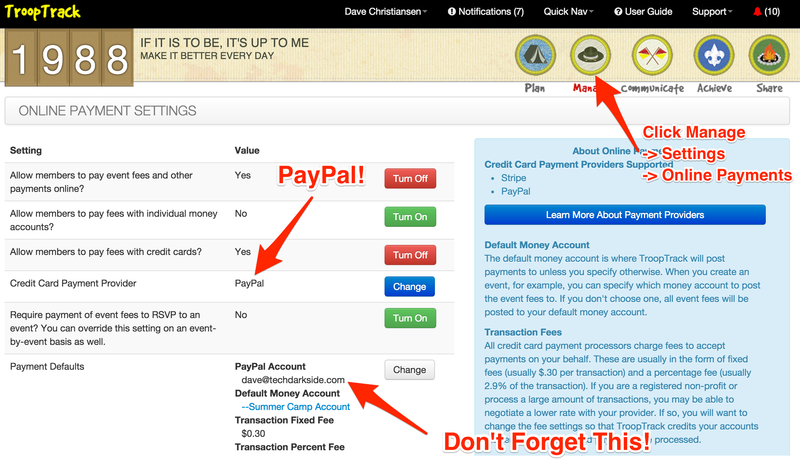 2) Improvements to RSVP'ing to events that require payment. Now refunding a ticket to an event resets the attendees status and guest count so that they can RSVP again as needed. Also, if you delete the money transaction from the money account, it will reset their RSVP there too. Withdrawing them from the event behaves similarly. 3) TurboNET roster importer works better with packs that have Tiger Cubs. Previously we were crashing trying to import Tiger leaders. Crash no more! 4) If you use Stripe or PayPal to accept deposits and don't like the $20 minimum deposit, you can now change it. Just go to Manage -> Settings -> Online Payments and you can set your own minimum. 5) If you are outside the United States and don't like the US format for phone numbers, you can now turn phone number formatting off on the TroopTrack settings tab. 6) Page breaks on the shopping list and award ceremony agendas have been problematic in the past, with text being cut in the middle or jumbled up in unreadable ways. No more - we now have clean page breaks for these important reports. 7) Exporting the results from the interactive rank book to CSV now includes all the fields from screen. 8) Simple Sign In Sheets. Have you ever been frustrated with all the options for generating attendance sheets? "I just want a SIMPLE SIGN IN SHEET" you said in a cross voice. This is for you - every event now has a simple sign in sheet with the name of your youth, a sign in box and a sign out box. Yay! 9) Have you ever tried printing every blue card for every merit badge ever worked on in your troop? Or some other REALLY large number of blue cards, using the merit badge book? You might have noticed that it didn't work. Well, now it does. That's a lot of stuff! What's next? 1) TurboNET imports now show you any members who don't have a BSA ID number in their profile and lets you fix them easily. This is important because if you have BSA ID numbers for everyone the importer will not need to rely on name matching and the likelihood of getting unwanted duplicates is reduced. 2) The big news is that the importer now includes information for all adult members and includes address, phone numbers, YPT, position, and Boys Life subscription info for everyone in your troop. Not released yet, but in the works: importing all training records from BSA. Good morning everyone. Today we are happy to announce the availability of PayPal as an additional payment provider in your online payment settings. You will now be able to accept deposits to money accounts and event fee payments using PayPal. All you need to do is choose PayPal as your payment provider in your online payment settings as shown below. Don't forget to provide the email address of the PayPal account for your unit as well as choose a default money account to post transaction fees to, as show below. PayPal transaction fees are $.30 + 2.9%. We are working with PayPal to get the percent fee lowered to 2.2% and hope to announce this soon. As with Stripe transactions, a $.25 TroopTrack processing fee is added to each transaction. TurboNET roster imports are currently failing for some packs. Not all users are impacted. We are working on it right now. We just pushed an update to production that fixes TurboNET roster imports for cub scout packs. Only product updates after September 2014 appear here.